The Lezyne Hecto Drive 400XL Special Edition is a multi-purpose performance LED cycling light designed for high-output illumination in a barspace-conscious body. The compact, durable and heat-dissipating CNC machined aluminum construction with a versatile handlebar strap that reduces the amount of clutter on the handlebars, while mounting to just about any type of handlebar around. Ultrahigh-output LED delivering up to 400 lumens and 8 different illumination modes, from a steady beam to several different eye-catching flash modes. With the Hecto Drive 400XL's Enhanced MOR (Maximum Optical Reflection) lens providing built-in side visibility, passing motorists, cyclists or pedestrians will still be able to see you. 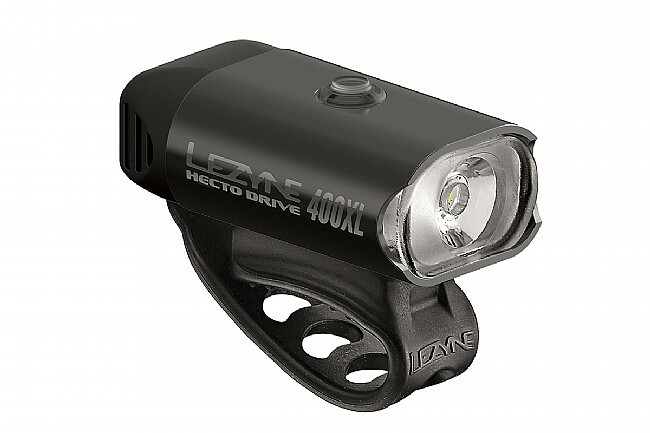 The Special Edition version of the Lezyne Hecto Drive 400XL Front Light features a unique finish, either Gold or Black. Blast: 400 Lumens / 1 Hour. Enduro: 150 Lumens / 2 Hours. Economy: 75 Lumens / 4 Hours. Femto: 15 Lumens / 18 Hours. Flash 1: 50 Lumens / 11 Hours 15 Minutes. Flash 2: 50 Lumens / 11 Hours 15 Minutes. Day Flash: 400 Lumens / 5 Hours 45 Minutes. Pulse: 50 Lumens / 12 Hours 30 Minutes. Weather-resistant CNC-machined alloy body stands up to passing showers or storms. MOR (Maximum Optical Reflection) Optics optimizes beam efficiency with built-in side visibility.